Things are moving along. This stretch is about 37 miles and has the first of the “big” Maine mountains (I mean besides Katahdin, of course). Crossing the Kennebec was interesting. The current in that river is very strong. The ferryman takes two hikers at a time. 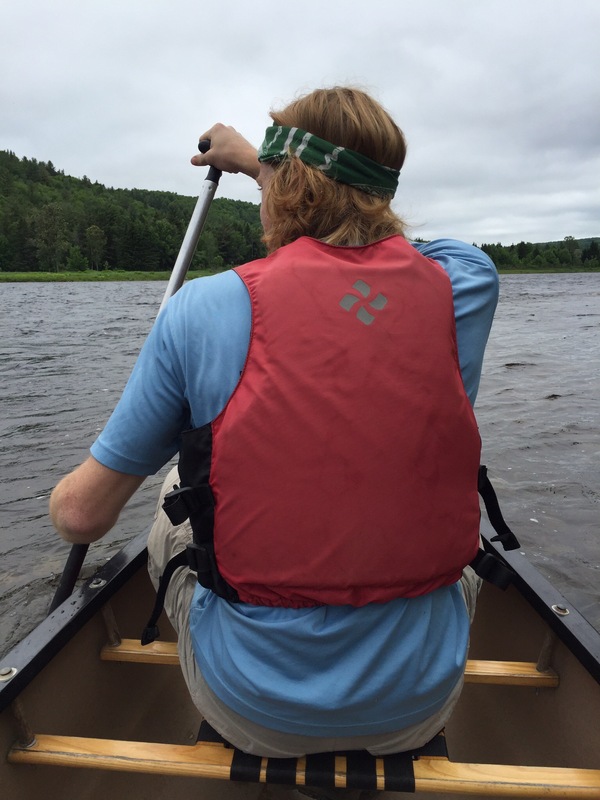 In spite of his vigorous paddling, the canoe moves downstream. When he let us out he told us the the previous day that spot was completely under water. ian paddling in the front of our ferry canoe. iI was dead weight. It took us 4 days to cross the Bigelow Range and reach Stratton. The first day was very light. We stopped at Pierce Pond Lean To after only four miles. There were two reasons: first the ferry ride took a while and spaced us out a bit; and second it rained that afternoon. So we hunkered down in the shelter, and signed up for the pancake breakfast at Harrison’s the next morning. I think hiker hunger has set in because I dream about pancakes every night now. 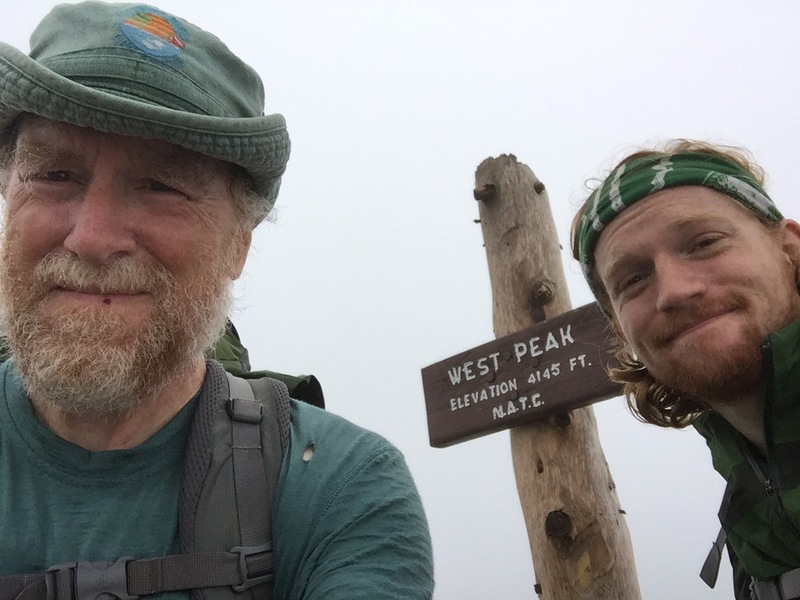 The second day, Ian and I hiked ten miles to the West Carry Pond LeanTo. 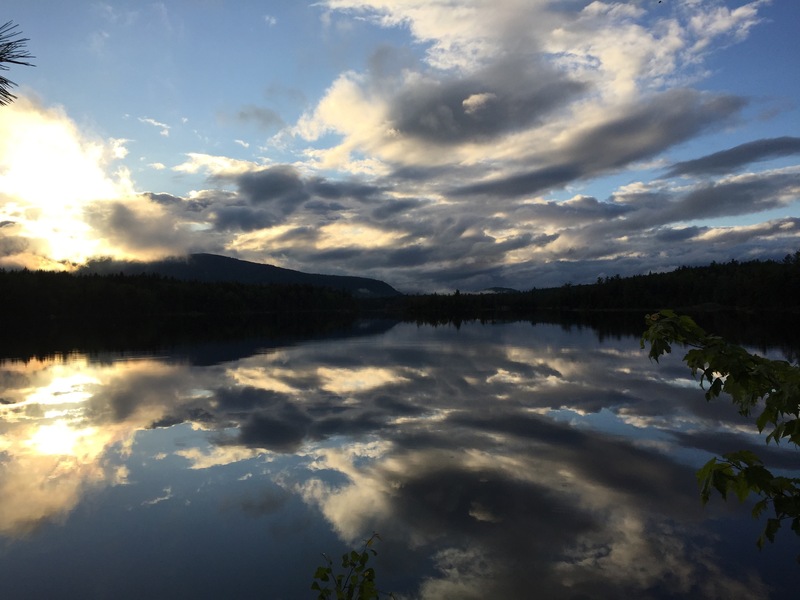 Others went farther – to Flagstaff Lake, or even over Little Bigelow. I’m trying to rehab the ankle and to get my trail legs without overdoing it. We had a whole group at the shelter including a couple of musicians. There was some music that evening. 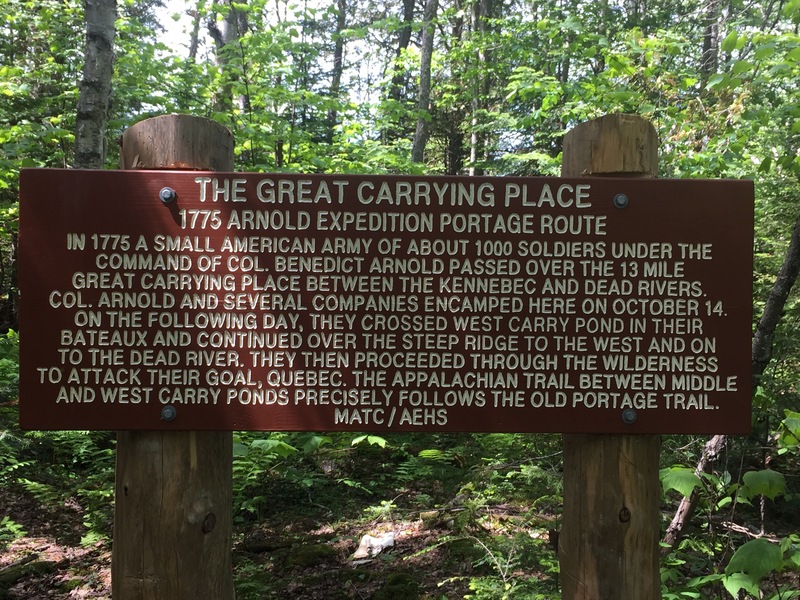 This region is known as the Great Carrying Place, and Is the way Native Americans moved from the Maine coast up to the Saint Lawrence River. In 1775, Benedict Arnold led 1,000 men over this route to attack Quebec City. Only 650 men made it. The Bigelow Range is actually named after one of Arnold’s officers: Major Thomas Bigelow. Interesting history! The third day, Ian and I hiked 13 miles over Little Bigelow and stayed at the Safford Notch Campground. This is nestled in between Little Bigelow and Avery Peak. 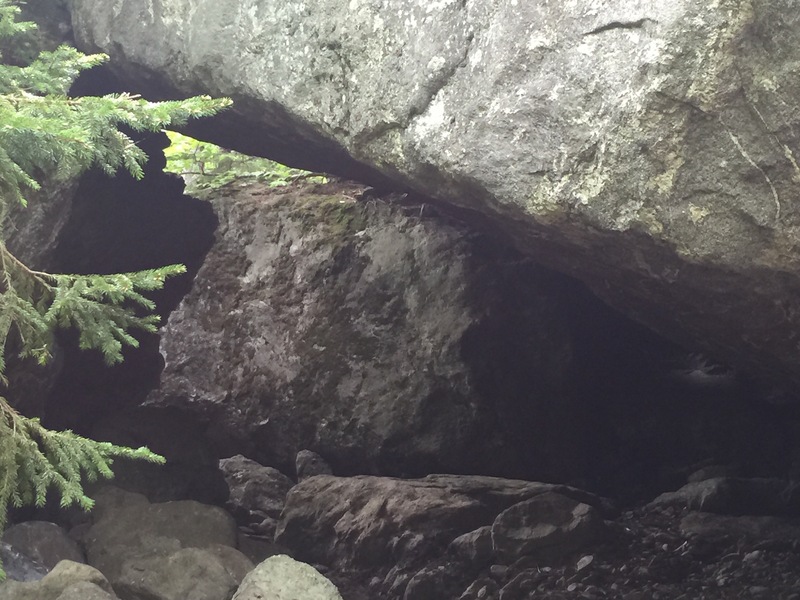 It has an interesting entrance through a boulder cave. We met up with Homer and Slingshot here. We had some rain that night, but it was done by about 7 AM. We also started to have consistent cell signal at this point, making it easy to check the weather. We also learned that Ben and Scavenger had to get off the trail. Scavenger’s legs are hurting her so she had to stop. Hopefully they will be back. Through here to get to the campground. Right out of Lord of the Rings. Day four was our first 4,000 footer. Actually two of them followed by a hefty 3,800 footer. All with alpine regions above the tree line. 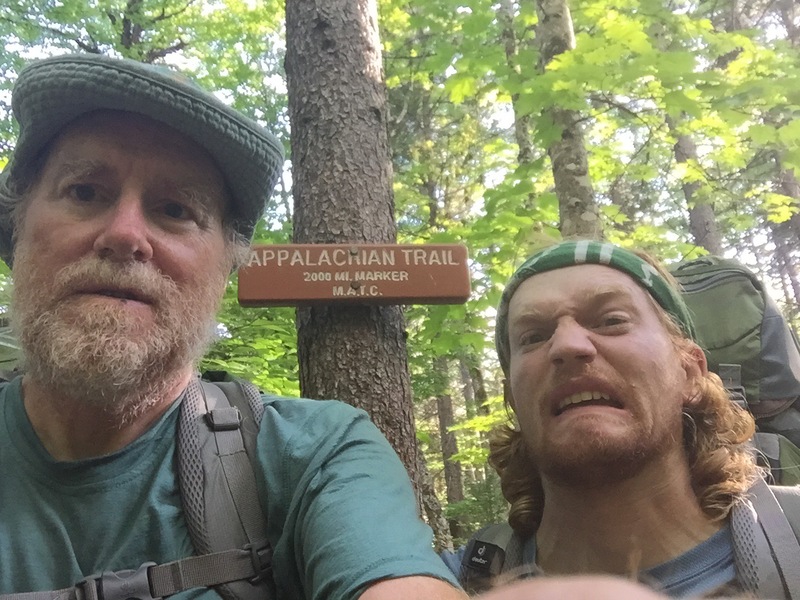 Ian and I traveled about 8.2 miles to Cranberry Stream Campground, about 2 miles short of ME 27 and Stratton. We did pass the 2,000 mile sign! At the top of West Peak. In the clouds! Our plan is to hit town early tomorrow, pick up a package from home, eat a big breakfast (pancakes!! ), and head back out on the trail. Our next zero day in town will be Rangely about 32 miles (and eight big mountains!) further on. Love following your posts George. I’m a SOBO as well but live in ME so started at ME/NH border heading NOBO to BSP to acquire trail legs. Then back to border & SOBO. Enjoy Rangeley! Try the Red Onion for eating. Also a gelato (forget the name) where you can sit and use the wifi. Love your updates, George, I’m rooting for you guys!